What does it mean to conserve is an era of ever growing rates of cultural, social, and ecological change? One dictionary definition of conservation I found defined it as the act of preserving, guarding, or protecting. But what does one guard or protect when gone is the certainty that even a particular habitat, species, park or preserve will remain viable in the relatively near future (next 100 or so years). What does that mean for how we conceive of conservation? The point was made dramatically by Dr. John Cairns, Jr who is considered by many the father of restoration ecology, when he stated in a recent memoir that restoration in the conventional sense of returning things to original condition, was no longer possible, because change is the new norm. While there certainly is a lot of cause for pessimism, we cannot afford pessimism, we need hope. So what is it that gives me hope? 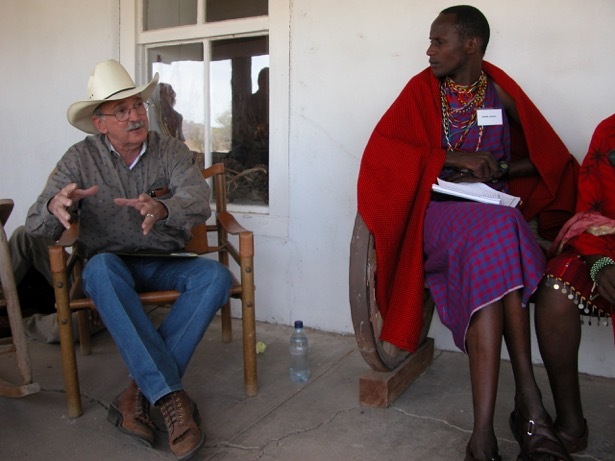 The bringing together of diverse groups such as Maasai from Kenya and ranchers from the southwestern US provides opportunities for peer-to-peer exchange and new ideas and innovations. A core source of hope is institutions and people’s approach to their stewardship of the earth. Not so much in the global sense of climate change conventions (though there is movement on that front too), but more the local call to action. That people do feel empowered. Much as the 1968 image of the earthrise from Apollo 8 radically changed the environmental conciousiousness by showing how small, and insignificant the earth was in contrast to the vastness of space. Climate change makes people profoundly aware of their power to change this planet. In small actions of defiance to make a difference, springs hope, and hope to the grist for action. This search for effective action does require rethinking existing institutions, and requires courage for one is essentially stepping off the edge of a flat earth and considering the ramifications of living on a sphere. Much of conservation science and policy suffers from the pathology of treating the earth as if it is flat, despite all evidence to the contrary. In my book The Science of Open Spaces I walk the reader through my own path of discovery to illustrate one paradigm for generating effective change in a complex and nuanced world. But more importantly it is an invitation for people to breakdown old barriers and find their own solutions. In the coming blog posts I will highlight a series of innovations and show how people are talking the future into their own hands and finding ways to make a difference. Charles G. Curtin is a senior fellow for the Center for Natural Resources and Environmental Policy on the University of Montana campus in Missoula. In his work he seeks the nexus of science and policy, with a long-term interest in environmental change, large-scale socioecological experiments, and conservation design.